This entry was posted in DirectAdmin购买 and tagged da授权, directadmin授权, 虚拟主机 on December 29, 2017 by yqf.me. This entry was posted in DirectAdmin安装教程 and tagged centos6, da授权, directadmin on February 22, 2016 by yqf.me. 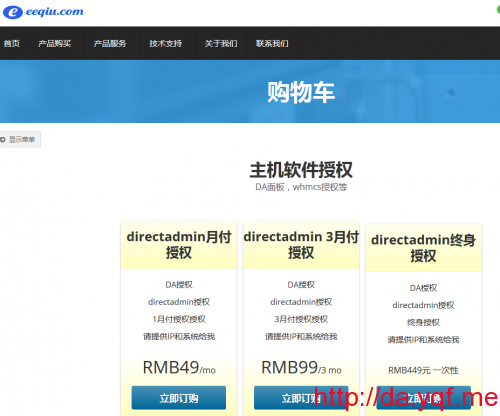 This entry was posted in DirectAdmin安装教程 and tagged da授权, directadmin, directadmin教程, 正版DA on June 1, 2013 by yqf.me. Zend Guard Loader has been installed. 然后我们再来看看php -v ，已经安装好Zend Guard Loader. This entry was posted in DirectAdmin安装教程 and tagged da授权, directadmin, zend, Zend Guard Loader on June 1, 2013 by yqf.me. This entry was posted in DirectAdmin安装教程 and tagged da授权, directadmin, mod_evasive, 防cc，cc攻击 on June 1, 2013 by yqf.me. This entry was posted in DirectAdmin安装教程 and tagged da授权, directadmin, 重装系统 on May 21, 2013 by yqf.me. This entry was posted in DirectAdmin购买 and tagged da授权, DA教程, DA面板, directadmin on May 21, 2013 by yqf.me.